In this time of division and rancor, songs of community and hope are needed more than ever. But such songs are useful only if they can persuade us to trust their message. And that’s one of the hardest tricks to pull off in pop music. In fact, any hint of sappy sentiment or formulaic bromides is likely to create mistrust and produce more pessimism than optimism. That’s why the Strumbellas are the right band at the right time. The Ontario sextet’s new album Rattlesnake boasts the kind of anthemic choruses that can rouse an audience from its seats to dance in place and sing along. The stimulus is not so much the positive lyrics—which are easy to write—but rather the magnetic melodies, which are so difficult to come up with. It’s not the words (“Hang on, kid, you’re my salvation”) that puts across the chorus from the album’s first single, “Salvation,” for example; it’s the irresistible vocal line (three descending half notes, a brisk, ascending triplet and a payoff on a rising note). That knack for melodic hooks is the most elusive talent in popular music, but lead singer/chief songwriter Simon Ward has it. It’s a dangerous gift, however, for it can all too easily lead to gooey treacle. Fortunately, Ward is aware of the danger and counterbalances his all-together-now choruses with darker, singer-songwriter verses. That balance grows out of his two major enthusiasms in music. Just before the big chorus arrives on “Salvation,” for example, the band drops away, leaving Ward’s acoustic guitar and his whispery voice to murmur, “Will they love me now?” Having voiced his self-doubt, Ward invites the band back on board and over the thumping drums and chiming synths tells himself, “Just put it all out, don’t let your head down.” The song wouldn’t work as well as it does if the hope hadn’t been countered by the doubt—and vice versa. Ooooh,” in stacked, four-part harmony. When the Strumbellas played the Newport Folk Festival in 2016, only a few in the crowd knew them, but by the time they played “Spirits,” the band had the crowd on its feet, bouncing to the contagious but paradoxical chorus, “I’ve got guns in my head and they won’t go; I’ve got spirits in my head and I won’t go.” Ward—sporting a long, curly brown beard, shades and gold slacks—bounced along with the audience. Isabel Ritchie underlined the hook with her violin and sang the top part of the harmonies, as the other four guys filled in below her. Even though the lyrics pointed out that our brains are full of both violence and transcendence, the music suggested that the latter might triumph in the end. 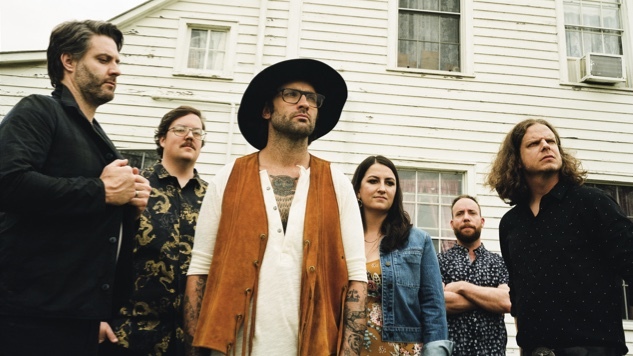 The Strumbellas are often compared to Mumford and Sons and the Lumineers, two other groups that often build folk songs to big pop choruses, but the Ontario sextet comes up with stronger choruses on a more consistent basis. Perhaps better comparisons are U2, Paul McCartney or Christine McVie’s songs with Fleetwood Mac. The Strumbellas are barely known in the U.S., but they’re a big deal in their native Canada. In 2017, the group’s song “Spirits” won the Juno Award (the Canadian Grammy) for Single of the Year, beating out Drake, The Weeknd and Shawn Mendes. They’re now hoping to replicate that success south of the border. The oddest aspect of the Strumbellas’ origin story is that four of the six members come from the same, small farming town of Lindsay, Ontario, but they didn’t play music together or even know one another very well till they had all moved independently to Toronto. It was there that Ward put an ad on Craigslist, seeking musicians to form a band. Three of those who answered (lead guitarist Jon Hembrey, bassist Darryl James and drummer Jeremy Drury) were from his hometown, Lindsay, an hour and a half northeast of Toronto, in Ontario’s snowy, forested lakes region. Ritchie and keyboardist David Ritter filled out the line-up. The alt-country movement of the ‘90s provided Ward with the proof that there was another way of making country music, with dark, folk verses and big, rock choruses. As a teenager, Ward found that such melodies were popping into his head, and he couldn’t get them out of his brain until he sang them into a recorder. He was in a short-lived hip-hop-rock band, but he never found an effective way to turn those tunes into songs he could perform. Even after he followed a girl friend to Toronto, he worked as a supply (substitute) teacher and other part-time jobs but never performed in public. Many of the melodies that Ward comes up with leave him cold as well. But every once in a while he invents one that knocks him out, and that’s the one that he’ll finish with chords, lyrics, a bridge and an arrangement. The rest of the band gets to weigh in on the final stage, suggesting tweaks to every phase of the song. “Running Scared,” another song from the new album, is one of those good ones. Over the vigorous acoustic-guitar strum of the folk verses, Ward confesses, “I’m borderline mentally unstable,” but he soon counters that with the maxim, “We can all live a better life if we want.” That’s enough to launch him into the hooky chorus, where he repeats again and again, “I’m running scared,” as if he’s trying to get away from the problems behind him (“Don’t look back,” he tells himself) and into the promise ahead. The melody lies so comfortably in the propulsive rhythm that it carries the listener along with the singer. By the end, Ward is belting out, “Running scared,” while his backing singers harmonize, “We can all get a little high if we want,” as if fear and hope were so inextricable entangled that they can’t be separated; they can only be reconciled inside an ear-grabbing chorus. When the band performed the song during their official South by Southwest showcase at the Bungalow, a now-beardless Ward was spinning about the stage with his arms flung out, as all five of his bandmates provided stacked harmonies behind him. The crushed-together crowd pressed up against the barricade, right arms raised overhead, as Ward in his broad-brim brown hat and long-fringe buckskin vest egged them on. It was as if he had sucked the audience into his push-and-pull dance of doubt and confidence.